This blog post idea occurred to me several months ago but I have been hesitant to commit to print. My first inclination was to describe the main characters of the drama without actually naming them. This stems from the age-old maxim, "if you don't have something nice to say...". But the third quarter improvement to profitability by both banks represents a return to the way it has been over the past decade... the smaller bank outperforms the larger one. I'm talking about First Commonwealth Financial Corporation ("FCF") and S&T Bancorp ("S&T") of Indiana, Pennsylvania. Most readers have no idea where on a map you can find Indiana, Pennsylvania. It's very name says "opposite", two states in one name. But if you bother to look at a map of the state, you will find Indiana in the James Carville description of Pennsylvania: "you have Philadelphia and Pittsburgh and Alabama in between". Indiana is in the Alabama in between. Think Punxsutawney Phil. Not exactly a budding metropolis; and yet it has two multi-billion dollar banks headquartered there. Both banks have been experiencing loan problems. The problems stemmed from that unquenchable desire to get bigger. Indiana and its surrounding communities lack the growth that can support such ambitions. So both institutions determined in the conference rooms in the executive suite to expand lending beyond their geography. Those decisions amplified their credit problems in a challenging environment. 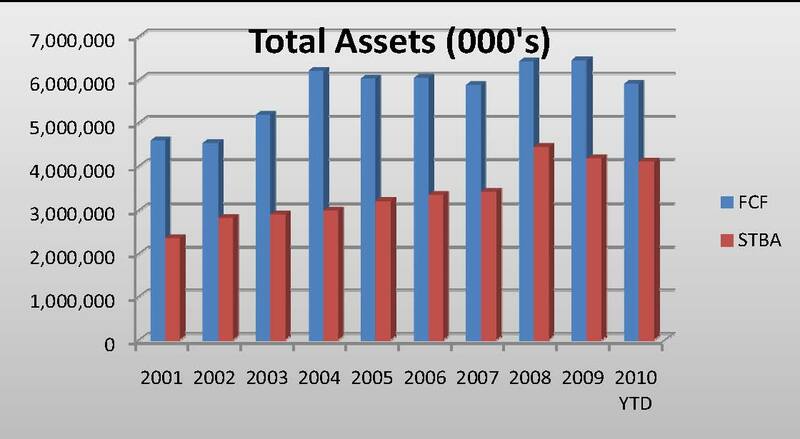 At September 30th, FCF's non-performing assets as a percent of assets (NPAs/Assets) were 2.70% and S&T's were 2.05%. Not disastrous, but not that good, either. Lending outside of your expertise, either by industry, types of loans, or geography, oftentimes ends in bad results. 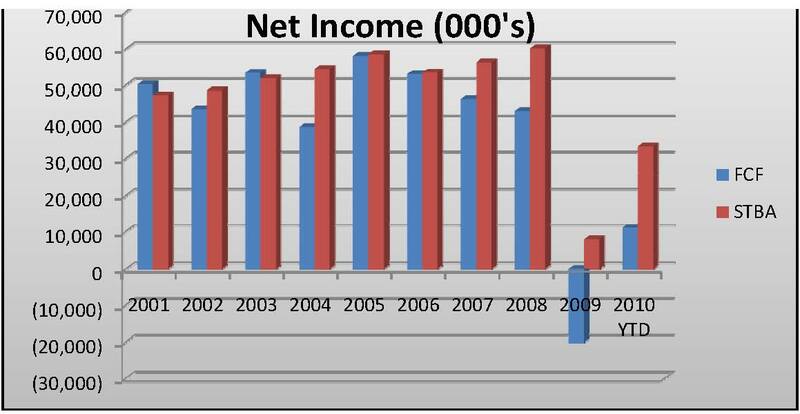 But in the midst of their challenges, S&T continues to outperform FCF. Year-to-date, S&T had an ROA of 1.07% and FCF had 0.24%. This was not an anomaly. S&T has had a superior ROA in every year that I reviewed (2001-2009). This flies in the face of the economies of scale crowd, that are running around to bank executives yammering for them to get larger or get out. As the chart below demonstrates, FCF has been larger than S&T. Some will object to my use of ROA as a proxy for profitability. But lets dispense of a debate on proper ratio analysis, and strip down financial performance to its rawest form, net income. 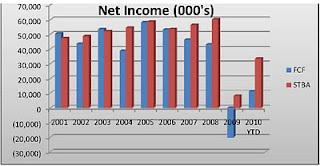 Although FCF has always been larger, S&T has always delivered superior net income to their shareholders (see chart below). How could such a larger financial institution be outdone by its smaller competitor across the street? One reason is net interest margin. In all periods that I analyzed, S&T had a superior margin. Year to date, S&T's margin was 4.04% versus 3.88% for FCF. This flies in the face of the asset quality stats noted above. 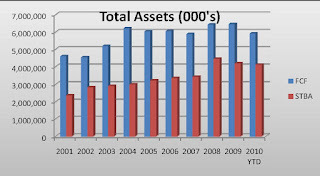 If S&T has a lower amount of non-performing assets, then it should have a smaller margin because it presumably lends more conservatively. Better credits would seem to demand lower loan coupons, one would logically think. Another reason S&T consistently outperforms FCF is efficiency ratio (net interest income plus non interest income divided by non interest expense). Year to date S&T efficiency ratio was 52.11% versus FCF's at 61.29%. Similar to the other ratios, S&T was superior in every period analyzed. I understand efficiency ratio is impacted by the superior margin, but there is more to it than that. S&T simply operates more efficiently, spending their operating expenses prudently. This works against the economies of scale gang because S&T is over 30% smaller than FCF in total assets. Both institutions engaged in M&A over the past ten years. S&T acquired two financial institutions totalling $1.1 billion in total assets for $261 million, equating to a purchase price of 24% of assets acquired. FCF acquired three financial institutions totalling $1.6 billion in total assets for $274 million, or 16% of assets acquired. Although I feel it safe to say that S&T was less acquisitive, I do not think "to buy or not to buy" is why there is such a disparity in financial performance. If not size, if not M&A, if not geography, then why does one consistently outperform the other? I do not think the obvious needs to be said, unless it is in the boardroom of First Commonwealth Financial. Special note: I am not making stock recommendations here. So don't call your broker to make a trade based on what I write. If you saw the performance of my stock portfolio, you would know what I mean. Well-written. In a prior life, I was often asked the same question re tale of two banks in the same community. They do drink the same water... The bottom line differential is often leadership and strategic focus. BTW, I believe that Indiana, PA was the home of Jimmy Stewart, one of my favorite actors. I have been in board meetings when there were two banks in one town and they know the numbers of their neighbors very, very well. It is usually a main topic of discussion... how the other bank is doing. The competition is healthy. When it leads to going outside of your expertise to "grow" is when things go awry. The legendary Jimmy Stewart does hail from Indiana, Pennsylvania.